"If you have a loquat tree in your back yard or know someone who does, you'll be trying to find something to do with them. This is a great tart and spicy way to use some up of those seemingly endless loquats. Recipe would work well with pork too. Loquats are very much a seasonal fruit. Late spring to early summer is the only time of year you can find them. Pairs very well with rice." Place loquats into a saucepan and stir in water, orange juice, and brown sugar until sugar has dissolved. Bring the mixture to a boil and stir in ground ginger, cinnamon, lemon pepper, and smoked paprika. Reduce heat to low and simmer until loquats are soft and starting to break apart, about 20 minutes, occasionally whisking vigorously to help break up the fruit. When sauce is thick, stir in vinegar and simmer 3 more minutes. Remove from heat. Heat grapeseed oil in a skillet over medium heat and pan-fry chicken breasts until golden brown and no longer pink in the center, 5 to 8 minutes per side. Remove chicken breasts and cut into bite-size pieces, return to skillet, and stir in 1/4 the loquat sauce, scraping and dissolving any browned bits of food into the sauce. Serve with remaining loquat sauce on the side. 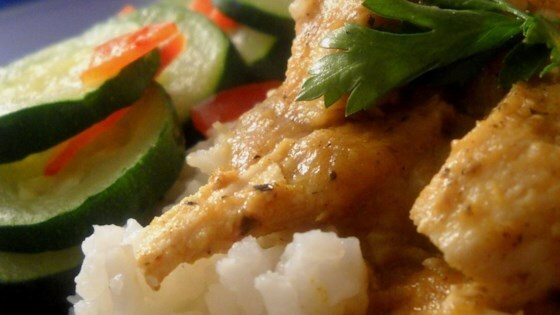 Put Asian flair in your weeknight faire! Yes. I'll definitely make it again. I'm collecting loquat recipes to make tasty use of all the fruit of my very happy loquat tree. Thanks! I reduced the ginger to 1 teaspoon, but kept everything else as called for. It turned out so delicious! Served over wild rice with a side salad. Definitely a keeper recipe for loquat season! Very tasty. The loquat flavor comes through. Booked marked this recipe for next time. Added a habanero to spice it up.